According to nearly 700 foreign companies surveyed, the business climate in Spain has improved again in 2016 and the forecast for the next two years looks even sunnier. This is according to the ninth edition of the Barometer of the Business Climate in Spain, prepared by IESE’s International Center for Competitiveness in collaboration with ICEX-Invest in Spain and Multinacionales por marca España, an association that works with multinationals to promote Spain as a brand. On a scale of 1 to 5, the country’s business climate is rated 2.9 overall. Spain’s strong points remain its infrastructure, quality of life, market size and human capital, according to those surveyed. Of the 10 areas evaluated, seven were rated more positively than last year. Only infrastructure, costs and financing saw slight year-over-year declines. Foreign companies’ bullishness on investment levels, local hiring, sales and exports for 2016 follows positive forecasts from last year. A resounding 95 percent of surveyed companies plan to maintain or increase their levels of investment in Spain in 2016 — up from 93 percent a year ago. Furthermore, these forecasts remain unchanged looking ahead to 2017. There is also a rosier outlook for employment: 91 percent of foreign companies expect to maintain or increase their Spanish workforce in 2016, a number that jumps to 95 percent looking to 2017. At the same time, 87 percent of companies expect to either increase or maintain their sales levels in 2016, 5 percentage points more than the previous year. That said, the increase came from more companies expecting to maintain their sales levels. Meanwhile, 62 percent see sales increasing in 2016, compared to 64 percent a year ago. The forecast for 2017 is more optimistic, with 69 percent expecting sales growth. With respect to exports from Spain, the forecasts continue to be positive, if cautious. In the survey, almost 70 percent of foreign companies are exporting from Spain to third markets. For 2016, 37 percent see exports increasing and 29 percent are maintaining previous levels. Only 4 percent see exports to third markets decreasing in 2016, dropping to 2 percent for 2017’s forecasts. 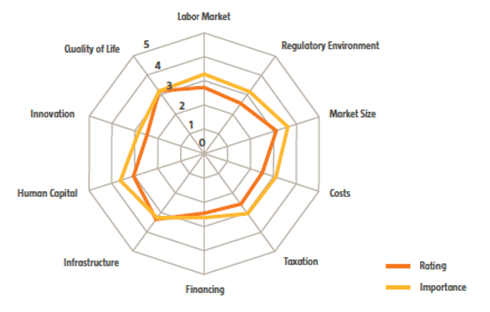 The aspects of Spain most highly rated by foreign investors are its infrastructure, market size and quality of life, followed by its human capital. Echoing last year’s results, foreign investors are particularly pleased with the quality of Spanish infrastructure — including airports, roads and high-speed trains. Other perceived strengths are public safety and the quality of its healthcare system. Finally, the availability of telecommunications networks/services as well as skilled and unskilled labor are also considered advantages by investors. Compared to 2015, Spain’s scores for seven of 10 key areas have improved, including the average rating for its market size — which has grown as the economy has recovered. In addition to increasing internal demand, exporting from Spain to third markets has become more attractive, too. The country’s main weaknesses remain its higher business costs, lower levels of spending on R&D for innovation and lack of access to venture capital or other types of funding. In terms of costs, higher electricity prices as well as spending on labor and taxation have discouraged some investors. Bureaucratic burdens and the scant availability of public subsidies were also cited as weaknesses. Although human capital ratings have improved since the previous year’s survey, room for improvement remains, with a notable gap between the country’s current rating and the importance placed on it by foreign investors. Three areas for priority action, according to investors, should be: improving workers’ language skills, amplifying their learning capacity, and their acceptance of responsibilities and targets. Other concerns include the bureaucratic burden on corporate operations and the cost of telephone and internet access. Spain remains the fastest-growing country among larger members of the European Union, with economic growth up 3.2 percent in 2015, accelerating and extending the gains of three consecutive years of growth. The study is based on questionnaire responses from nearly 700 foreign companies. Each year since 2007, questions have been classified into four major groups: (1) a general overview of business conditions for Spain; (2) costs, taxation and funding opportunities; (3) infrastructure and resources; and (4) quality of life. Respondents offer ratings (1 to 5) and comments.